The Bolingbrook Babbler: ‘There’s one more thing?’ Steve Jobs to speak on 8/2/2012 at 6:00 PM? ‘There’s one more thing?’ Steve Jobs to speak on 8/2/2012 at 6:00 PM? 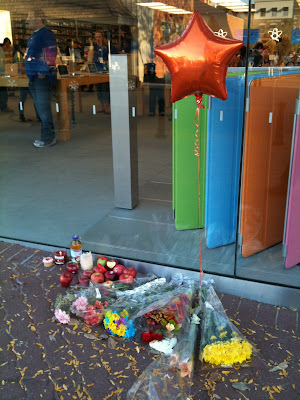 Will Steve Job address the cult of Mac on 8/2/12? Some high priests in Naperville, IL believe he will. “The signs are obvious!” Said Rev. Steve Redman. “He would never leave us without saying, ‘there's one more thing!’ There is one more thing, and he will reveal it to us next year. Redman cites the blog posts of his assistant, Rev. Steve Jonas. According to Jonas, Apple is leaving clues to Job’s return. Jonas believes that if enough people buy the iPhone 4S, and are comfortable with the new voice assistant feature, Siri, Apple will release an iPhone 5 next year. He also believes he knows when the iPhone 5 will be released. As for his 6 PM prediction, Jonas says it is also obvious. Redman believes he knows what Jobs will say on every iPhone 5 that fateful day. Another Naperville priest, Rev. Steve Shaw has a more moderate opinion. Larry, an employee at the Naperville Apple Store, didn’t answer this reporter’s question about the alleged return of Steve Jobs.